The re-sorption of carbon compounds from the rhizosphere was investigated using 14C-labelled glucose, mannose and citric acid. Uptake in roots of 5-day-old, intact Zea mays plants in sterile solution culture was determined over a period of 48 hours. Under optimal growth conditions significant re-absorption of glucose and mannose occurred with the uptake rates being 70.5 and 40.2 μg compound g-1 root DW h-1, respectively. For glucose and mannose approximately 25% of the 14C label taken up by the root was recovered inside the plant as low-MW compounds and 33% polymerized into high MW compounds. 42% was respired as 14C-CO2. Citric acid by comparison showed little accumulation within plant tissues (11.4%) with most being respired and recovered as 14C-CO2 in KOH traps (88%). The uptake rate for citric acid was 34.8 μg g-1 root DW h-1. Over the 48-hour period a net efflux (i.e. exudation) of labelled plus unlabelled C was observed at a rate of 608 μg C g-1 root DW h-1 (equivalent to 1520 μg glucose/mannose). Of the C released as root exudates, a minimum estimate of the amount of C taken back into the plant was therefore 9.5%. The two main C fluxes within the rhizosphere, namely release of C by the root and uptake by the microorganisms, have been well documented in recent years. It is now apparent however that a third flux term, re-sorption of C by roots, can also be identified. 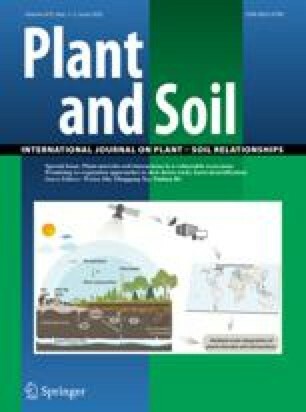 This may play an important but previously overlooked role within the rhizosphere, and further work is needed to determine its significance. A comparison between exudate release in static (permitting accumulation of C) and flowing culture (C removed as it is released) was also made with the respective rates being 15.36 and 45.18 mg C g-1 root DW in 2 days. The relative important of re-sorption in natural environments and laboratory experiments is discussed.